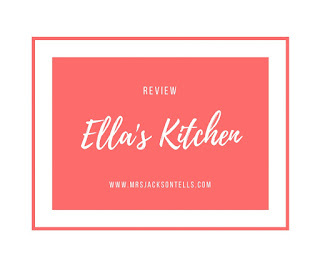 Mrs Jackson Tells: Obstetric cholestasis | What is it? Tellings of a curly haired young mum, wife, uni student. 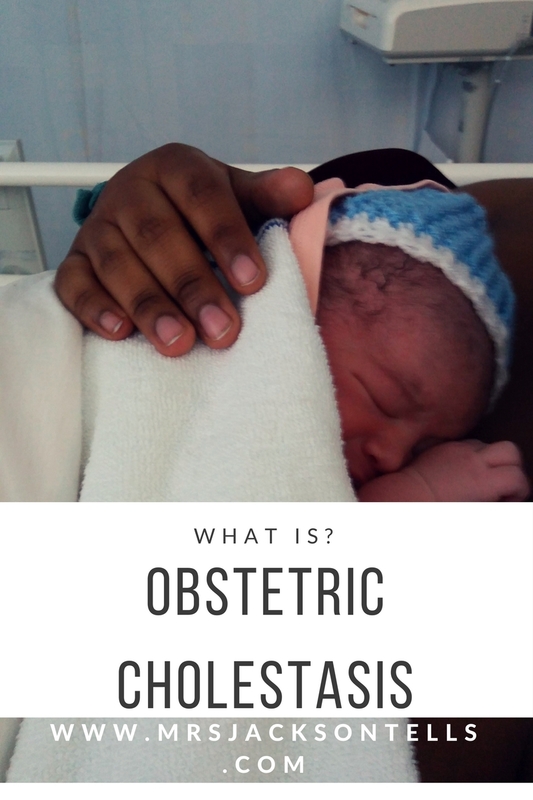 Obstetric cholestasis | What is it? 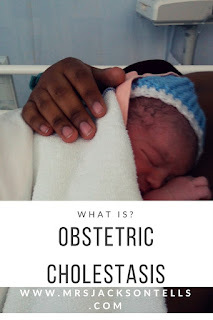 This post is going to be about obstetric cholestasis and how it affected me. In my last post about pregnancy, Eli's birth story, I lightly touched on it and how it changed the end course of my pregnancy and so in this post I'll go into it a bit more. Obstetric cholestasis is when your liver stops functioning as it should and you get a build up of bile acids in your body. This causes mild to severe itching which will make you really uncomfortable, but even more serious, it can increase the chances of stillbirth if you have a high bile acids level. There is no cure for it but it tends to go once you give birth. There are different courses of action taken depending on how far along your pregnancy you get it and just how far above the normal level your bile acids are. You get diagnosed but getting a blood test which is called liver function test or LFT for short. Within that test you'll results for your bile acids, GGT, AST, ALT among others. From what I was told and through research, symptoms, itching, typically start at around 30 weeks and tend to be concentrated on the palms of your hands and soles of your feet, but not exclusively. I started getting itchy around 20 weeks but thought that it was due to an allergy, so I went to the doctors to see if there was anything I could take which would help. When I got to the doctors she thought the same, but since some antihistamines can be bad for the baby when pregnant, she ordered some tests just to make sure it was nothing else. The results came back and she told me that some of the tests came back abnormal and that I should probably do then again because due to body changes and hormones etc. sometimes your results can be slightly higher or slightly lower than usual. I went back, did them again and they were still abnormal, at which point I was referred to a consultant. The doctor never once mentioned obstetric cholestasis or anything else for that matter and so I went and did some research myself. I found out about obstetric cholestasis and thought that maybe that was what I had. I went to the hospital for my consultant appointment and was met by a doctor who didn't seem to be too interested in me as a legitimate patient. When I got there he, in not a very nice tone, asked me what I was doing there and why had I come there. Immediately I was on edge and didn't feel confident about my situation because if he had simply looked at my pregnancy book, which he had taken off of me at the start, he would've known and also because despite me having done some research myself, the GP that asked for my tests never really told me what was going on or why I needed to be referred to a consultant. I told him that I thought that it was because my tests were abnormal which I thought maybe meant that I had obstetric cholestasis and he just said that they were too low and sent me on my way. It seemed like he was rushing me as he thought that I was just a first time mum who was over analysing things and getting worried for no reason but the thing is that I didn't refer myself... The GP did without even telling me why. This incident got me even more worried because it made me feel like nobody was caring about me and my baby and like I was being pushed round. On top of that, I was getting reduced movements and so I was having to go back into hospital to get a scan to get Eli checked which just made me think that maybe they were all related. Thankfully the scan showed us that everything was fine. My itching just kept on getting worse and so I went back to the doctors to see if there were even any creams that might help or what else could it be since it apparently wasn't OC. This time, I saw a new doctor that gave me some antihistamines that were okay through pregnancy and said that they didn't know why the last doctor hadn't given me this. The antihistamines didn't work. I continued to get reduced movements and so had to go into hospital again to go get checks. Between the GP doctors and the doctors that came to check on me when I was admitted, I was told that it wasn't that I didn't have OC, it was that my results weren't high enough for them to be able to do anything about it. Due to the continuous itching and recurring hospital visits for reduced movements I started getting my bloods done every 2-3 weeks and saw a consultant afterwards as well. The itching again, just kept getting even more worse than before to the point where I couldn't sleep, I'd go out and just start itching outsude, who knows what other people though when they saw me. The GP doctor gave me suggestions on what to try, diprobase, calamine, nothing helped. At 34/35 weeks I got my last LFT's taken at the GP. I called in around 5 days later to find out about the results. My bile acids were now over the normal range, which according to my research meant that I now officially had obstetric cholestasis. I thought that the GP would've wanted me to come in, but got told that a consultant already had my results and since I had an appointment with a consultant in the hospital at 36+2, that I should just attend that. While this was happening, I had heard a youtuber say that one of the mummies from her nct had unfortunately and very sadly lost her little angel a few days before her scheduled induction due to the obstetric cholestasis. This made me even more worried than I was before and anxious to see the doctor. In the meantime while I waited for my appointment to approach, I was preparing myself mentally as I was expecting to be told that I would have to be induced early at 37 weeks. I asked her why so soon and she said that it was so that we would both be completely safe and since my last scan showed that everything was okay, it would be safe. When I left the hospital, I was relieved. Why you ask, I mean I'd now been diagnosed with something that could be dangerous to us, especially Eli, yet I was relieved? Well.. finally I knew that it was OC that I had, that I hadn't just been making things up and getting worried for no reason, that it wasn't just a bad allergic reaction but that there was actually something wrong and that I did well in going to the doctors to get it checked out. I have told Eli's birth story in a previous blog pot so if you want to know how my induction went, refer to it. I have to say though that the reduced movements and OC were not related, that I know of. Something that getting OC has taught me, is to never ignore a symptom whether pregnant or not but especially when pregnant or relating to your child. Always follow it up with a visit to the GP, and if you're still not convinced keep going at it because thankfully, nothing happened to my beautiful little angel Eli, he was born a perfect healthy boy, but had I ignored it and just thought that I was being over dramatic and it was just 'first time mum nerves', it might not have turned out the same. When I was pregnant I was subscribed to the BabyCentre forum and part of some forum pages. I have to say that being on them helped me out a little as there were some, very few, which is to be expected, mums that had had mentioned a little about their experiences with OC after I asked bout it. Despite there being a few mums on there who helped me learn a little more about it, what I realised is that there wasn't a lot of support from doctors or even a consensus between the health professionals on what levels they deemed acceptable and which required immediate interference. this lowered my confidence in my own doctors and got me even more worried. I hope that this blog helps someone out there in the same position and makes others aware of OC and what it is. If you have any questions about OC or anything I've mentioned please do not hesitate to contact me or comment below. You could also get some information on the nhs website. The group was started by a mother who had OC/ICP and works with scientists researching the condition. I think that posts like this are so helpful to the parenting community. You do a service to many with your open sharing. Wow, what a scary situation to be in. Your grace and composure is insipiring! Thank you, thankfully it all turned out all right. You are so strong! Thank you for sharing your story. Thank you!! Just thought of how much it would've helped me so hopefully it helps others. Thank you for sharing your story - it takes a special person to overcome their hardships and share them so other's may learn. Always trust your instincts! So unfortunate that some doctors loose their ability to listen to their patient and treat them as individuals... or even humans! Couldn't agree with you more!! Unfortunately that's the case. But if we all knew more about what's out there I guess we could then try and help ourselves, having said that some could argue that then we'd all go self diagnose ourselves wrongly when it could be something else and fill ourselves with worry. There's a good and a bad side to every solution. Going through the more than average unknown during pregnancy can be scary, especially when no one close to you has gone through the same thing. This post will be very helpful to someone going through a similar situation! That's what I'm hoping, even if it's just one person I'll then know my job was done.